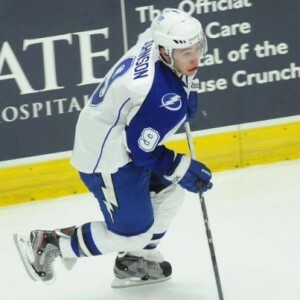 Tyler Johnson needs to elevate his game if the Crunch wish to make a comeback in this series. This wasn’t the way the Syracuse Crunch wanted to start their Calder Cup Final run. The Crunch, who won the Calder Cup with many of the same players a season ago as the Norfolk Admirals, dropped the first two games of the Calder Cup Final and will now look to dig themselves out of a substantial hole when they head to Grand Rapids to face the Griffins for three straight road games. In game one, the Crunch held the Griffins to just 21 shots on goal, but Grand Rapids was still able to pull out a 3-1 win, getting a big goal from forward Riley Sheahan with eight minutes to play, giving the Griffins a crucial 2-0 advantage. Jean-Philippe Cote managed to score the lone goal for the Crunch, beating Griffins’ goaltender Petr Mrazek with just under seven minutes to play in regulation. However, it proved not to be enough, as Grand Rapid’s leading scorer Gustav Nyquist buried an empty-net goal late. It was a completely different game for the Crunch in game two, but it was the same result. Despite scoring four goals, the Crunch couldn’t keep the Griffins off the board, dropping game two by a score of 6-4. Cedrick Desjardins allowed six goals on just 29 shots for Syracuse. The Crunch were led offensively in game two by Brett Connolly, J.T. Brown, Richard Panik, and Andrej Sustr, who registered a goal apiece in a losing effort. Syracuse will now look to put its experience to use, when they travel to Grand Rapids for game three on Wednesday night. Crunch fans know it’s quite the whole to dig out of, but if anyone can do it, it’s the Crunch. After all, an Admirals team with many of the same core players rattled off 29 straight wins a year ago, en route to winning the Calder Cup Final, so anything’s possible, right?